Does any body know what is the current status of embedding fonts into an svg file that is readable by inkscape. I find the lack of embedded fonts severely impedes portability of svg files, particular if sending the file to a person who doesn't have admin access on their machine and cannot install fonts. I, to be fair am trying to get this to work on windows, not linux (I don't have access to a linux machine right now). Does any one know of or have access to an actual svg file where this feature is working? In the current version of Inkscape seems not yet possible to embed SVG fonts (see also here a little example). As a SoC 2008 project, JucaBlues implemented initial parsing and rendering of SVG Fonts. You can design fonts within Inkscape, but using them to render text on the canvas is not yet supported. We are waiting for libpango to implement proper support of the user-fonts feature. The font was copied locally following this url (get from here) and obtaining the download link (conveniently renamed into "indie_flower.woff"). Unfortunately (see above), Inkscape at the moment is not able to render it and use the default font. At the moment...let's wait and see. 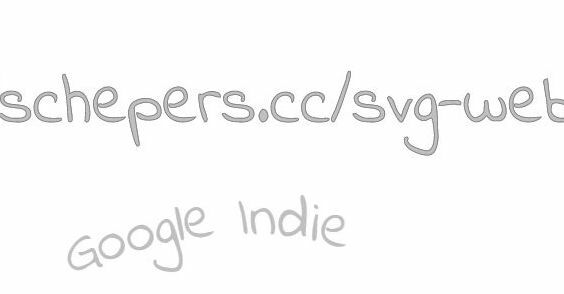 You can make a portable SVG file by converting the text to a vector path. Select the text object, then go to the menu Path → Object to Path. (You could also use Stroke to Path, depending upon what you want to do). Of course as a vector, the text will no longer b be editable as text, but that may not matter as much to you as being able to have your SVG viewable on the other end. Not the answer you're looking for? Browse other questions tagged fonts inkscape svg embedded or ask your own question. How do I embed Google Web Fonts into an SVG?